At the beginning of August, 1999, I succumbed to my ever-present urge to visit the deserts of Southern California in search of scenic beauty and interesting wildlife. You may have figured out from the rest of my web site that I'm particularly interested in reptiles and amphibians, a.k.a. herps. Fortunately for me, reptiles abound in deserts. I brought everything I would need for a four-day driving trip through the hot hot deserts: a big cooler full of ice, water, and snacks, various maps, hot-weather clothes and hat, my trusty Pentax ZX-5n camera with lenses and tripod, and of course my copy of Sherburn Sanborn's indispensible Lizard-Watching Guide. Don't leave home without it. Some of the animals I most hoped to find were fringe-toed lizards. In many trips to the desert throughout my life I had somehow managed to completely avoid seeing any fringe-toed lizards (can you imagine?). 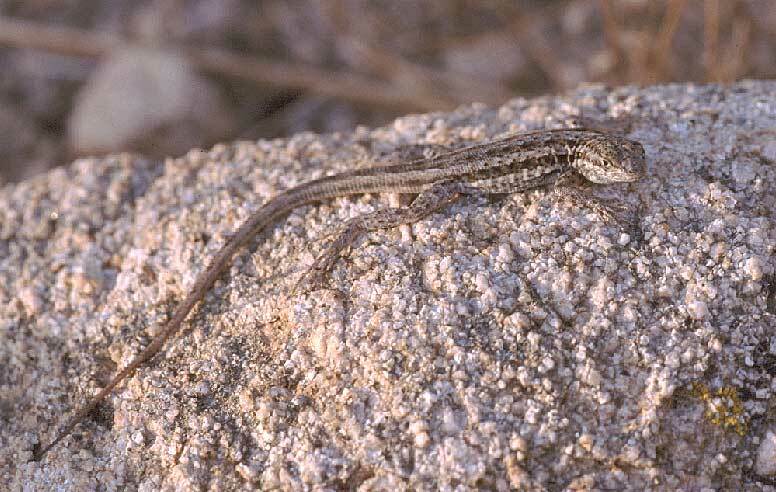 There are three species in the United States: the Colorado Desert fringe-toed lizard, the Mojave fringe-toed lizard, and the endangered Coachella Valley fringe-toed lizard. All three live on wind-blown dunes, using their fringed toes to gain purchase for fast running and quick submerging in the loose sand. I would be travelling through the ranges of all three species. If I were lucky, maybe I'd see some this time. If I were really lucky, maybe I'd see more than one of the three species. I arrived at Big Morongo Canyon in mid-afternoon after driving down from our home in beautiful Pacific Grove, California. Big Morongo Canyon is a small riparian preserve in the Morongo Valley just west of Joshua Tree National Monument. Birders like it because like most desert oases it's full of birds. I discovered that it's especially full of those annoying birds like towhees and juncos that hop around in the bushes and leaf litter sounding like lizards. However, herp-wise it was a disappointment. A few tadpoles here and there, the occasional whiptail, and the usual assortment of side-blotched lizards (one pictured here). The only exciting moment was when I lifted a rock and out shot a desert night lizard. 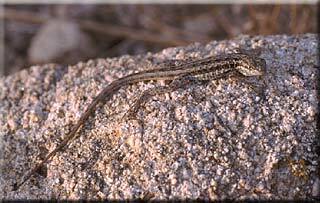 I had often looked for desert night lizards where they're supposed to live -- under fallen branches of Joshua trees and other yuccas -- but had never yet seen one. My camera was not fast enough to capture the little speedster though. 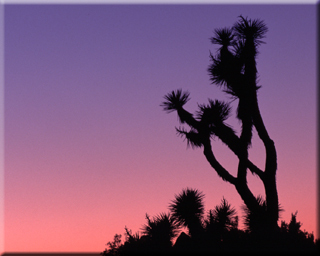 That evening, I waited for dark near Black Rock campground in Joshua Tree National Park. The sky turned all sorts of lovely colors as I was waiting. This is, of course, a Joshua Tree. After dark I was disappointed to see no snakes. In fact, just so you don't get your hopes up, I'll tell you now that I saw only one snake (a coachwhip) on the whole trip. But the nighttime was filled with mammals. Kangaroo rats darted around everywhere, interspersed with occasional smaller rodents. 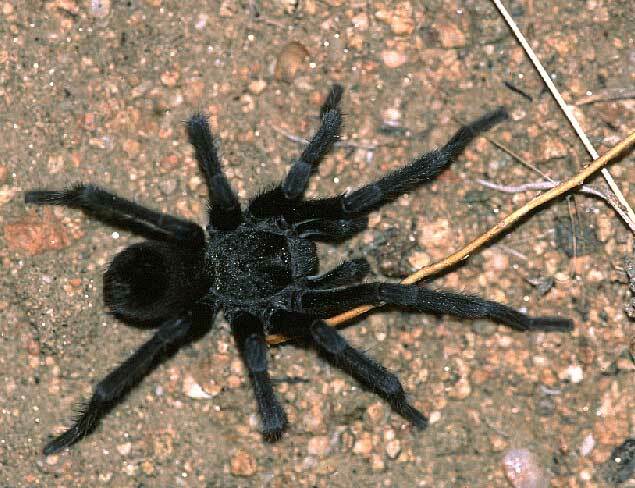 Larger nocturnal mammals I saw included jackrabbits, desert cottontails, and a coyote. But taking pictures of speedy nocturnal mammals is a losing proposition, so this tarantula is the only nocturnal critter represented here.